When a young artist drew a portrait of one of his heroes and tweeted it to him, he never expected a response from the subject of his work. 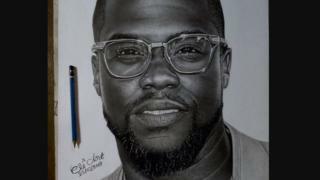 That is what happened to 26-year-old Eli Waduba Yusuf, who told the BBC it was it was like a "dream" when US comedian and actor Kevin Hart directly contacted him about the portrait he'd created. Yusuf, a hyper-realism artist from Nigeria, had spent two weeks drawing a detailed pencil image of Hart that looks like a black and white photo. Others also saw the work and began tweeting Hart about the talented young artist. Eventually, the artwork came to the actor's attention and he responded to one user: "Talent out of this world... Wooooooooow". The reaction to Hart's reply had more than 310k likes in the first 24 hours with people tweeting their congratulations to Yusuf and wishing him well. Yusuf said he was "thrilled" to be contacted by the actor: "I still can't believe it; it feels like a dream. It's been so overwhelming. Kevin Hart has just blew my mind." He went on to say: "A lot has changed - a few days ago I was just a local artist who loved drawing and would have loved the world to see my work, but I didn't know it would happen so fast. "Here I am having an interview with the BBC - please someone should wake me up!" Before 'distracted boyfriend', was there 'distracted girlfriend'? One Twitter user was impressed by the portrait. Another tweeted her thanks to Hart for recognising Yusuf's talent. Another user welcomed the positive news coming from her country of Nigeria. Hyper-realism is a form of art that looks very realistic. The pieces can resemble photographs. The high-resolution element takes the art beyond photorealism. The art tends come in the form of paintings or sculptures. But other mediums such as pencil can be used to create the works. Image caption Yusuf: "My mother has been a source of encouragement to me, even though she never had a formal education and came from a poor background"
Yusuf describes how the artist Arinze Stanley inspired him to work in the hyper-realism genre. "His work showed me the possibilities of art, so I decided that whatever I see I must replicate and do even better," he said. "I made sure that every new work I do is better than the previous one." Meanwhile, there is speculation as to who the celebrity friends are that Hart would like Yusuf to draw. Some thought that it could be ex-wrestler turned actor Dwayne 'The Rock' Johnson. One Twitter user said: "The Rock is about to have a great drawing of himself." Whoever the lucky recipients of the new portraits are, Yusuf's art has just got very real.